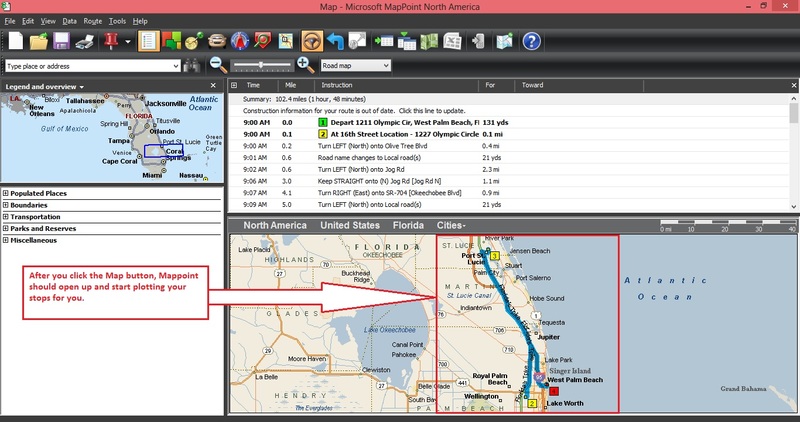 First, Make sure that you have either Mappoint 2011 or Mappoint 2013 installed on the computer that you are attempting to Map from. A 14 day Mappoint trial can be downloaded here. 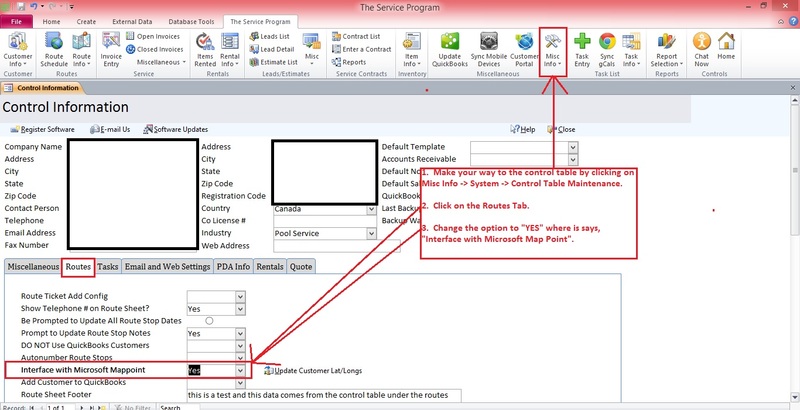 Go to the Control Table and make sure The Service Program has been set to work with Mappoint. This can be done by going to Misc Info -> System -> Control Table Maintenance. Once you are on the "Routes Tab" you will need to change the option to "YES" where it asks, "Interface with Microsoft Mappoint". Next, you will need to go to your Route Schedule. 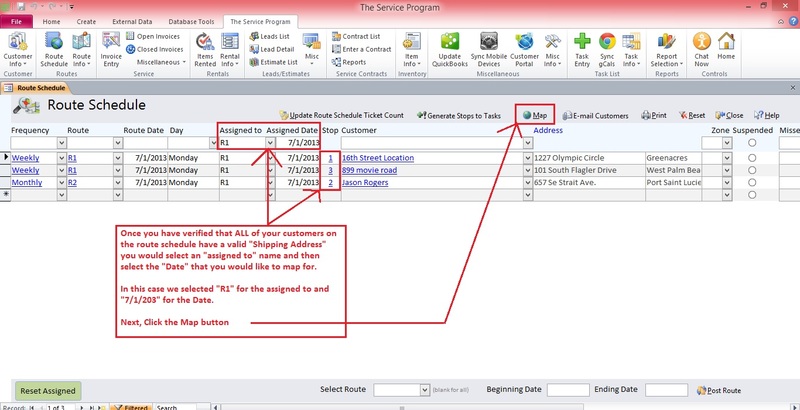 This can be done by clicking the "Route Schedule" button at the top of The Service Program. In order to "Map" you will first have to tell it which route and what day to map. To do this, Select the Route name under the "assigned to" area and the route day that you are mapping under the "assigned date" area. Verify that there are NO duplicate stop numbers (I.E. you cannot have 2 routes with the same stop number). Once you have selected your Assigned To and Assigned Date you can click the "Map Button" shown in the screenshot above. This will open up Mappoint and should map your route. If your route does NOT map then you should go into each customer on the route "that you are attempting to map" and verify that they have a valid shipping address. ***IMPORTANT NOTE*** If you change any Shipping Addresses for your customers make sure you re select that customer name from the Route Schedule to apply the new address before attempting to map again. Microsoft Mappoint can be very touchy as far as the addresses that it accepts. Sometimes the best practice is to add a longitude and latitude for each customer address as shown below. This helps to minimize the "confusion" that Mappoint runs into when mapping roads with the same name in multiple areas of the world. To add a Longitude and Latitude you can go to google.com and type in Longitude and Latitude and then search for a site OR you could use this site Click Here for A Longitude and Latitude tool provided by Itouch Map. 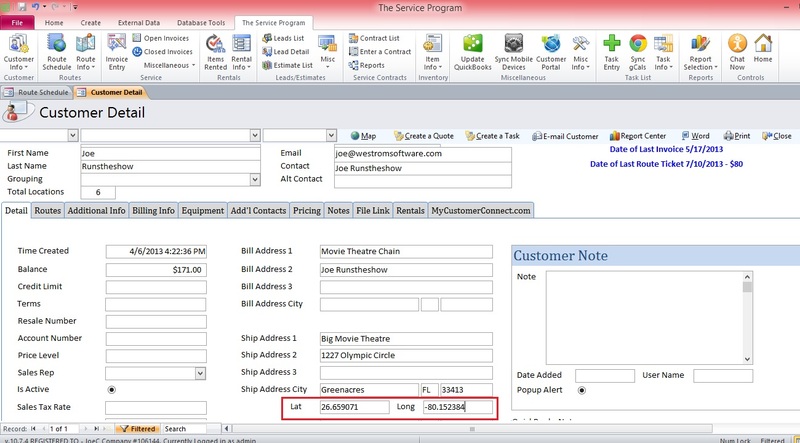 Make sure you reselect the customer name anytime you change the address or add a long/lat as this will make sure the database applies the changes. If Mappoint starts but doesnt even add a number 1 to the map then the issue is with your company address that is set in the control table. You will notice that there are 2 areas for your address in the control table (To get to control table click Misc Info ->System -> Control Table Maintenance). The Address that is located all the way to the left hand side is what Mappoint uses when mapping. The address that is located in the middle of the page is where you could put a complete address with a P.O. Box or Suite number if needed.